The Pillar of Fire International is a Methodist Christian sect with headquarters in Zarephath, New Jersey. In 1901, the Church was founded by Alma Bridwell White in Denver, Colorado. The Pillar of Fire was originally incorporated as the Pentecostal Union, but changed its name to distance itself from Pentecostalism in 1915. While the Pillar of Fire is Methodist in doctrine, Alma White and her followers believed that the Methodist Church had become corrupt. 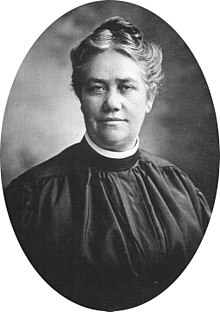 Alma White and the members of the Pillar of Fire dedicated themselves to the holiness movement in the Wesleyan tradition. Adherents were referred to as "Holy Rollers" and "holy jumpers" because of their religious frenzy. White was noted for her association with the Ku Klux Klan, her feminism, anti-Catholicism, antisemitism, anti-pentecostalism, racism, and nativism. We have no connection with the Klan organization. We endorse them in the principles for which they stand. However there is no room in our hearts for racial prejudice. The slaveholder, in many instances, was as much to be pitied as the slaves. He, too, was a victim of the system. ... .Where the slaves were well treated they were happy and contented ... But some radicals could never see this side of the question. They dwelt continually on the cruelties of a few hard taskmasters and ignored the good people who had the welfare of their dependants at heart. No matter what the better class of slave owners might do, they had to bear the stigma of cruelty with the worst of tyrants. ... .Where property rights are involved, supported by the government, the only safe and sane way to make wrongs right is by cool-headed procedure. The Klansmen stand for the supremacy of the white race, which is perfectly legitimate and in accordance with the teachings of the Holy Writ, and anything that has been decreed by the Almighty should not work a hardship on the colored race ... It is within the rights of civilization for the white race to hold the supremacy; and no injustice to the colored man to stay in the environment where he was placed by the Creator. ... When the black man was liberated it was time for women to be enfranchised, without which the colored man with his newly-acquired rank became her political master. ... The white women bore the sting of humiliation for more than half a century in being placed in an inferior position to the black men in the use of the ballot and the rights of citizenship ... To whom shall we look to champion the cause and to protect the rights of women? Is there not evidence that the Knights of the Klu [sic] Klux Klan are the prophets of a new and better age? The Pillar of Fire Church strongly argued against social and political equality for Blacks and advocated for racial segration and repeal of the fifteenth amendment. The Pillar allowed the Klan to hold meetings or cross burnings on at least several of the church's numerous properties including numerous documented Klan gatherings in Zarephath, New Jersey; Brooklyn, New York; Bound Brook, New Jersey; Longmont, Colorado; and Westminster, Colorado. White participated directly in many of these meetings. During this time, the Pillar of Fire Church published The Good Citizen, a monthly 16 page political magazine and three books, The Ku Klux Klan in Prophecy, Klansmen: Guardians of Liberty, and Heroes of the Fiery Cross, all of which heavily promoted the Klan and its agenda from 1921 until 1933. Ideologically, in these publications, the Pillar of Fire Church promoted anti-Catholicism, antisemitism, nativism, and white supremacy, all primarily under the guise of patriotism. Much talk has also arisen over her brief but significant association with the KKK, which has also been publicly condemned and repented of by the POF leadership with a request for full forgiveness. Despite these and other errors in its history, the Lord in His grace and mercy has chosen to bless the ministry. We regret, repudiate and repent, and ask for full forgiveness for anything in our past that is short of Christian standards based on God's Word, following Jesus' model prayer that teaches us to ever pray and forgive us our sins for we also forgive everyone that is indebted to us. (Luke 11:4) We specifically regret mistakes and bad judgement by previous generations or anyone in our membership of the past. While the Pillar of Fire's repudiation characterized its association with the Klan as brief, it continued for at least several decades to promote its ideologies of intolerance for religious and racial minorities and of equality for white Protestant women. In 1943, 22 years after the church began publicly working with the Klan, it republished Alma White's pro-KKK books as a three-volume set under the title Guardians of Liberty, reaffirming its positions in support of anti-Semitism, white supremacy, nativism and most notably, anti-Catholicism. Volumes II and III of Guardians had introductions by Arthur White, affirming his support for his mother's intolerant ideologies, primarily but not exclusively in regard to anti-Catholicism. After his mother died in 1946, he was the Pillar of Fire's general superintendent until 1981. Following the death of the founder, under the leadership of her son, Arthur Kent White, the religious fervor declined and the emphasis on outreach evangelization and church planting ended; the organization branches in America fell from a high of around 52 to the current six. Today the Pillar of Fire has branches in Zarephath, New Jersey; Denver, Colorado; Westminster, Colorado; Cincinnati, Ohio, Los Angeles, California; and Pacifica, California. It primarily operates four ministry focuses, namely local church, radio, education, and missions. The name of Pillar of Fire comes from Exodus 13:21–22, which states: "By day the Lord went ahead of them in a pillar of cloud to guide them on their way and by night in a pillar of fire to give them light, so that they could travel by day or night. Neither the pillar of cloud by day nor the pillar of fire by night left its place in front of the people." The organization's theological position is self-described as Wesleyan–Arminian. The central beliefs of the Pillar of Fire are as follows: biblical inerrancy, Trinitarianism, the physical resurrection of Jesus, the consubstantiality of the Holy Spirit, the "universal depravity of the human race", the necessity of "repentance toward God, and faith toward our Lord Jesus Christ", belief in "justification by faith and in Christian perfection, or entire sanctification, as a second definite work of grace", the immortality of the soul, the resurrection of the dead, and premillennialism. The Pillar of Fire continues its work today working in three main areas: radio, education, and missions, both local and overseas. The Zarephath Health Center was opened in 2003 and utilizes volunteer physicians, nurses and support people to meet the health care needs of the poor and uninsured on the campus at Zarephath, New Jersey. The Health Center sees 300–400 patients per month who otherwise would not be able to obtain affordable health care. Dr. Eck testified to the Joint Economic Committee on Health Insurance on April 28, 2004, to demonstrate the sustainability of this model. The oldest of their missions was in Hendon London, England, and was established in 1904 by Alma White. The mission organized a Charitable Trust on 19 September 1992, and was registered as a charity in December 1992 (Charity No. 1015529). In response to a complaint received by the Charity Commission in 2002, an inquiry was held, the charitable trust dissolved and transferred its assets to the U.S. organization, and the charitable trust was removed from the registry as it had ceased to exist. One of the stated aims of this mission was to evangelize the local Jewish population in the vicinity of the mission. Ironically, after the mission was sold, the property became a kosher boutique hotel in 2010. Reverend Smallridge was given permission to start a Pillar of Fire Church in Nigeria in 1974. The Pillar of Fire was established in Malawi in 1984 by Reverend Moses Peter K. Phiri. Somerset Christian College, now known as Pillar College and has campuses in Somerset and Newark, NJ and looking to span across the state. Alma Bridwell White (1862–1946), the founder and first general superintendent from 1901 to 1946. Arthur Kent White (son of the founder) 1946 to 1981, second general superintendent. Arlene Hart Lawrence, granddaughter of the founder, 1981 to 1984, third general superintendent. Donald Justin Wolfram, great-nephew of the founder, 1984 to 2000, fourth general superintendent. Robert Barney Dallenbach (born 1927), husband of granddaughter of the founder, 2000 to 2008, fifth general superintendent. Joseph Gross, 2008 to present, sixth general superintendent. Reverend Robert K. Cruver, Jr.
Reverend Thomas A. Goode, he sued the church in 1920 saying the church "had alienated the affections of his wife and defrauded him of his property"
1915 Publishes "Why I do not eat meat"
2008 Robert B. Dallenbach loses vote of confidence at 2008 camp meeting. Vice Superintendent Joseph Gross becomes sixth general superintendent. Alma White, the Pillar of Fire, and their association with the Klan are dramatized in Libba Bray's New York Times best-selling 2012 murder mystery The Diviners, in a chapter titled "The Good Citizen." The Diviners is being made into a feature film by Paramount Pictures. ^ "Pillar of Fire". Tax Exempt Organization Search". Internal Revenue Service. Retrieved July 9, 2018. ^ a b "Pillar of Fire International". Pillar of Fire International. Retrieved January 19, 2017. ^ a b c d e f g "Bishop Alma White, Preacher, Author. Founder Of Pillar Of Fire Dies At 84. Established Several Schools and Colleges". New York Times. Associated Press. June 27, 1946. Retrieved August 21, 2007. Bishop Alma White, founder of the Pillar of Fire Church and author of thirty-five religious tracts and some 200 hymns, died here today at the headquarters of the religious group at near-by Zarephath. Her age was 84. ^ "'Holy Jumpers' An Old Religion Headed By A Woman. Something About This Curious Sect Which Lillian Allen Crossed the Sea to Join and Was Stopped by Immigration Authorities". The New York Times. December 11, 1910. Retrieved December 16, 2009. When Lillian Alien, the English girl, was halted by the immigration authorities last week at the cabled request of her well-to-do father, it was disclosed that she had come here to join a religious sect called the "Pillar of Fire," or the "Holy Jumpers." ^ "How They Jump, Where They Jump, When They Jump, Why They Jump, and Who They Are". The New York Times. August 18, 1907. Retrieved August 21, 2007. Hidden on a little New Jersey farm, a community of sixty persons, one-half of them children, are trying to vitalize a complete reaction against money greed, hypocrisy, and the present-day Christian Church and to keep it alive by religious hysteria. ^ a b "Bound Brook Mob Raids Klan Meeting: Thousand Hostile Citizens Surround Church and Lock In 100 Holy Rollers". The New York Times. May 2, 1923. Retrieved September 22, 2010. Until the arrival of eight State troopers to reinforce the local police here at 1 o'clock this morning about one hundred members of the Holy Rollers were locked up in their church, the Pillar of Fire, in Main Street, surrounded by a mob of nearly 1,000 hostile citizens, several hundred of whom broke up a meeting held by the Holy Rollers to organize a Klan here last night. ^ Mitchinson, Cyril Edwin (1927). The Babbitt Warren. ^ "Poor Aimee". Time. October 22, 1928. Retrieved August 21, 2007. Worst of all, there came a rival female evangelist from New Jersey, a resolute woman with the mien of an inspired laundress—the Reverend "Bishop" Mrs. Mollie Alma White, founder and primate of the Pillar of Fire Church. Bishop White, who has thousands of disciples ("Holy Jumpers") in the British Isles, clearly regarded Mrs. McPherson as a poacher upon her preserves or worse. ^ Kandt, Kristin E. (2000). "Historical Essay: In the Name of God; An American Story of Feminism, Racism, and Religious Intolerance: The Story of Alma Bridwell White". Journal of Gender, Social Policy & the Law. 8: 753. Alma White and the Pillar of Fire were unique, however, in their public alliance with the Ku Klux Klan. In fact, the Pillar of Fire was the only religious group to publicly associate itself with the Klan. ^ Neal, Lynn (June 2009). "Christianizing the Klan: Alma White, Branford Clarke, and the Art of Religious Intolerance". Church History: Studies in Christianity and Culture. 78 (02): 350. doi:10.1017/S0009640709000523. White's words and Clarke's imagery combined in various ways to create a persuasive and powerful message of religious intolerance. ^ Kandt, Kristen (2000). "Historical Essay: In the Name of God; An American Story of Feminism, Racism, and Religious Intolerance: The Story of Alma Bridwell White". Journal of Gender, Social Policy & the Law. Alma White and the Pillar of Fire were unique, however, in their public alliance with the Ku Klux Klan. In fact, the Pillar of Fire was the only religious group to publicly associate itself with the Klan. ^ Blee, Kathleen (1991). Women of the Klan. ISBN 978-0-520-07876-5. Bishop White's transformation from minister to Klan propagandist is detailed in voluminous autobiographical and political writing. [Bishop] White's anti-Catholic, anti-semitic, and racist message fit well into the Klan's efforts to convince white Protestant women that their collective interests as women. ... were best served by joining the Klan. ^ White, Alma (1928). Heroes of the Fiery Cross. The Good Citizen. I believe in white supremacy. ^ Guardians of Liberty, Vol. 1, Alma White, page 120. ^ Guardians of Liberty, Vol. 3, Alma White, Chapter 7, White Supremacy, page 103. ^ Dean, Clarence (December 17, 1960). "Brooklyn Scene: A Quiet Byway Is Invaded by Death and Chaos" (PDF). New York Times. Retrieved December 18, 2010. The gray stucco church into which the plane rammed was a three-story, gabled structure known as the Pillar of Fire Church. ^ White, Alma (August 1929). "America---the White Man's Heritage". The Good Citizen. Pillar of Fire Church: 3. Where people seek for social equality between the black and white races, they violate the edicts of the Holy Writ and every social and moral code ... Segregation is our only hope. Social and political equality would plunge the world into an Inferno as black as the regions of night and as far from the teachings of the New Testament as heaven is from hell. The presumption of the colored people under such conditions would know no bounds ... This is white man's country by every law of God and man, and was so determined from the beginning of Creation. Let us not therefore surrender our heritage to the sons of Ham. Perhaps it would be well for white people to take the advice of a great American patriot, Dr. Hiram Wesley Evans and repeal the Fifteenth Amendment. The editor of The Good Citizen would be with him in this. ^ White, Alma (August 1929). "America---the White Man's Heritage". The Good Citizen. Pillar of Fire Church: 4. ^ Wagner, Albin. "Westminster University Princeton of the West" (PDF). Retrieved November 21, 2009. The church established a junior college and bible seminary there, which after 1925 was called Belleview College. The campus of the school was frequently used for meetings of the Ku Klux Klan during its hey-day in Denver, and residents recall burning crosses high on the hill. ^ "The History of the Pillar of Fire". Belleview College. Retrieved March 26, 2009. ^ "Pillar of Fire: What We Believe". Pillar of Fire Church. Archived from the original on September 27, 2007. Retrieved April 14, 2008. ^ "Missions". Pillar of Fire Church. Retrieved January 23, 2010. ^ "Pillar of Fire, Registered Charity No. 1015529" (Press release). Charities Commission. March 16, 2005. Archived from the original on August 20, 2003. Retrieved August 30, 2006. ^ "Missions: Great Britain". Retrieved March 30, 2011. Hendon is predominantly a Jewish area. This makes the subject of Jewish evangelism a priority to us in Hendon. ^ Leon Symons (October 28, 2010). "Last orders as shuls buy pubs". The Jewish Chronicle. Retrieved March 30, 2011. ^ "Pillar Missions in Nigeria". Pillar of Fire Church. Retrieved January 23, 2010. Reverend Smallridge introduced Essien to Pillar of Fire leadership, and in 1974, was given permission to start a Pillar of Fire Church in Nigeria. ^ "Pillar Missions in Malawi". Pillar of Fire Church. Retrieved January 23, 2010. The Pillar of Fire Church was established in Malawi in 1984, when Reverend Moses Peter K. Phiri, a native of Malawi, contacted Pillar of Fire to discuss African missions. ^ "Local Church and Partner in Ministry". Pillar of Fire Church. Archived from the original on October 8, 2007. Retrieved September 25, 2007. Our school and church belong to a group of national and international ministries founded and directed by the Pillar of Fire, International. The Pillar of Fire provides us with oversight, advice, and material support, and gives us opportunities to participate in congregational, educational, media, and missions ministries around the world. ^ "Klan Buys College Close to Princeton". The Harvard Crimson. October 31, 1923. Retrieved July 6, 2009. Bishop Alma White, the founder of the Pillar of Fire Church, and an author of various religious works, is President of the institution under the new regime. In an interview for the Princetonian today Bishop White deplored the present indifference of the undergraduate to the Klan and predicted that in the near future "it will sweep through the intellectual student classes as through the masses of the people." ^ AM91 & Castle History, accessed September 1, 2006 - "KPOF is the oldest station of the Pillar of Fire Network, which is the oldest network of Christian Stations in the World." ^ Star 99.1 Jobs, accessed September 1, 2006 – "STAR 99.1 is a radio-ministry of Pillar of Fire"
^ Jaker, Bill; Sulek, Frank; Kanze, Peter (1998). The airwaves of New York. ISBN 0-7864-0343-8. ^ 93.3 Cincinnati Ohio Christian Radio, accessed September 1, 2006 - "93.3 WAKW is a service of Pillar of Fire, a not-for-profit 501(c)(3) organization"
^ a b "Bishop Arthur White, 92, Dies. Headed Pillar of Fire Church". New York Times. September 18, 1981. Retrieved July 21, 2007. Bishop Arthur K. White, president and general superintendent of the Pillar of Fire Church in Zarephath, New Jersey, died Monday at his home in Zarephath. He was 92 years old. ^ "Somerset Christian College". Somerset Christian College. Archived from the original on 2009-09-06. Retrieved 2009-10-17. ^ "Minister Sues Pillar of Fire. Charges Organization With Alienating Wife. Reveals Secrets and Requirements of the Cult. Avers Head Has Amassed Fortune from Gullible". Los Angeles Times. December 31, 1920. Retrieved 2010-01-11. Charging that the Pillar of Fire, an organization of nation-wide scope, of which Alma White of Bound Brook, N.J., is founder, had alienated the affections of his wife and defrauded him of his property, the Rev. Thomas A. Goode, a former member of the organization, today filed suit in the District Court for $100,000 damages. ^ Who's who in American education. Who's Who in American Education. 1966. Retrieved 2009-07-07. ^ Gertrude Metlen Wolfram (1954). The widow of Zarephath. Pillar of Fire Church. ^ a b Robert McHenry (1983). Famous American women. ISBN 0-486-24523-3. ^ Denver Radio: 80 Years of Change, accessed September 1, 2006 – "On March 9 , KPOF went on the air and was owned by a religious movement called the Pillar of Fire. ^ "New Jersey AM Radio History, Page 8 (1300 to 1380)". Radio-History.com. Retrieved 17 December 2013. ^ "Fundamentalist Pillar". Time. July 8, 1946. Retrieved 2007-09-25. [She] built a sect called Pillar of Fire — with 4,000 followers, 61 churches, seven schools, ten periodicals and two broadcasting stations. Last week, as it must even to 'the only woman bishop in the world,' Death came to the Pillar of Fire's 84-year-old founder. ^ "Ray Bridwell White; Pillar of Fire Church Leader, Son of Late Bishop, Dies". New York Times. November 6, 1946. Retrieved 2007-08-21. ^ a b c "Promoted to Glory: Donald Justin Wolfram, 83, Bishop". Belleview College. Retrieved 2007-08-26. Dr. Donald J. Wolfram left this life on August 25, 2003, after a brief bout with pancreatic cancer. He was 83. He was immediate past president and general superintendent of the Pillar of Fire International Christian denomination, an office he held from 1985 through 2000. He was laid to rest at Belleview Cemetery, Westminster, Colorado, on the campus where he had labored so faithfully for the Lord. Dr. Wolfram was born November 13, 1919, at Zarephath, New Jersey, to Rev. Albert and Rev. Gertrude Metlen Wolfram, pioneer missionaries in the Pillar of Fire. He was ordained to the ministry at age 16, later was consecrated a bishop, and spent his life working for the cause of Christ and holiness of heart and life. Blee, Kathleen M. (1991). Women of the Klan. University of California Press. ISBN 978-0-520-07876-5. This page was last edited on 1 January 2019, at 21:51 (UTC).